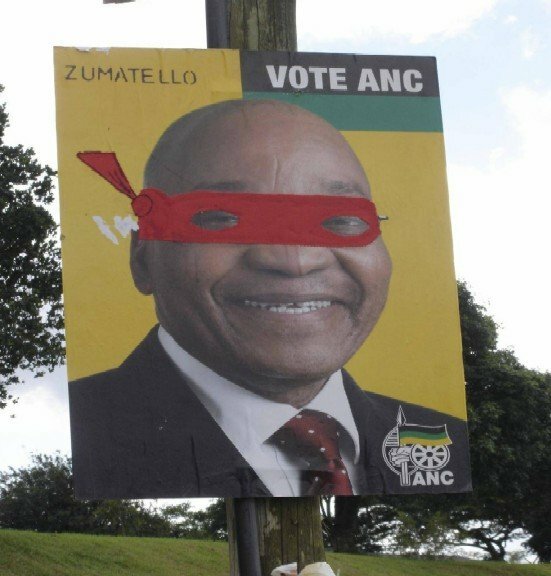 Zumatello hits the election campaign. Donatello (who wore the purple mask, of course) was the brilliant scientist, inventor, engineer, and technological genius. He was perhaps the least violent Turtle, preferring to use his intellect to solve conflicts. Zumatello (who is wearing the red mask, above) is the brilliant ANC President, polygamist, alleged fraudster and political genius. He is perhaps the least trusted Turtle, preferring to use his friends as scapegoats to avoid prosecution. 6000 miles… does not condone the defacing of election campaign posters unless it’s really, really amusing and you send photographic evidence to us here chez 6000.